On the last weekend of May in Palanga City there was held the traditional 16th festival “Sport for All”, the program of which included over 30 sport events starting from junior roller-skating competitions to beach rugby for veterans. The idea of the festival is to stimulate physical activity of people of different age. The weather did not spoil the holiday; and the economic crisis did not scare away the participants of the festival who came to the seashore from all over Lithuania. Various sport and social organizations – members of “Sportas visiems” (Sport for All) Association delegated over 5 thousand active citizens to the festival who promote healthy lifestyle. According to the organizers’ count more than 10 thousand participants including Palanga City inhabitants and guests of the place tried themselves in the festival events. People of different age took part in competitions of throwing a horseshoe, darts, bending hands, roller-skating, street basketball, football, shooting, quadrate, orienteering (incl. night orienteering and orienteering for people with limited abilities), beach volleyball, rugby, handball, tug-or-war, sport fishing, bowling, ultimate Frisbee (fly disc), running and other sports, mass sport exercises, meditation, tried “Northern foot-race”, and watched performances of aerobics’ masters and dancing groups. Traditionally Lithuanian Association of General Gymnastics brings more than 1000 participants to the festival. The grandiose mass exercise performed at the city stadium is already becoming a sign of the festival. This year the exercise was performed by more than 600 gymnasts! Each year due to new ideas the festival becomes more interesting. A lot of novelties were introduced this year as well. First of all, more contests were transferred from the stadium to Basanavichaus street. At least, organizers of darts tournament assured that it was worth it: this time a lot of foreign tourists, who often walk along the street and do not go to the stadium, took part in the tournament. “Ritinis” (or “ripka”) was returned to the festival program. The city stadium hosted student mini-ritinis tournament. For the first time bowling competitions were organized. Competitions of throwing a ball over a net suggested by the union of healthy lifestyle supporters were a great success. The main point of the game is as follows: a pair is trying to throw a ‘ball’ – a balloon with water- over a net with a towel, and a pair on the other side of a volleyball ground tries to catch the ball. A team consists of 4 pairs. The healthy lifestyle supporters could not explain the origin of the game. ‘Ukmyarge citizens suggested it…’ said they perplexedly. Another unusual performance could be seen in Basanavichaus street. 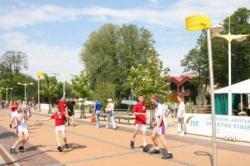 Russian delegation, which had been invited to Palanga by‘Sport for All”, presented a world-popular sport, unknown in Lithuania – korfball or ‘Holland basket’. The peculiarity of the sport is that mixed teams made up by men and women compete on the playground. 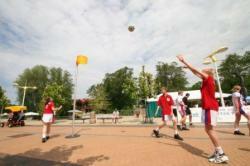 Member of Russian junior team U-16 demonstrated korfball features in Palanga City.